Believe it or not, 2018 is coming to a close and the last of my online classes for 2018 begins on October 5, 2018. 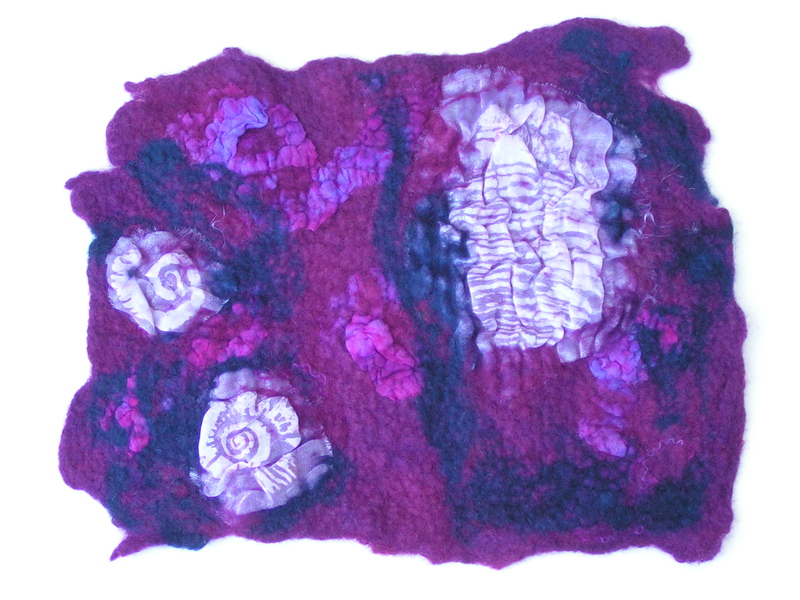 There are four different modules that are all about experimentation with mixed media techniques creating surface design on felt. Each class is 4 weeks in length with an extra 2 weeks of instructor support at the end of the 4 weeks. The classes are only $45 US with PDF information and videos presented each of the 4 weeks. There is a ton of information packed into the 4 weeks so it’s a great bargain. Anyone from anywhere in the world can take these courses, no need to show up at a certain time (you can even wear your pajamas). The first module is called Nuno Felting with Paper Fabric Lamination. You will learn the technique of Paper Fabric Lamination and then how to use these pieces in nuno felting. As you can see from the examples above, there are many possibilities with this technique. All of the samples above were created by students who have taken the class in the past. Click here for more information and to register for the class. The second module is Experimental Screen Printing on Felt. The samples above were created by former students in the screen printing class. You will also be able to use these techniques to screen print fabric such as silk to use in nuno felting. 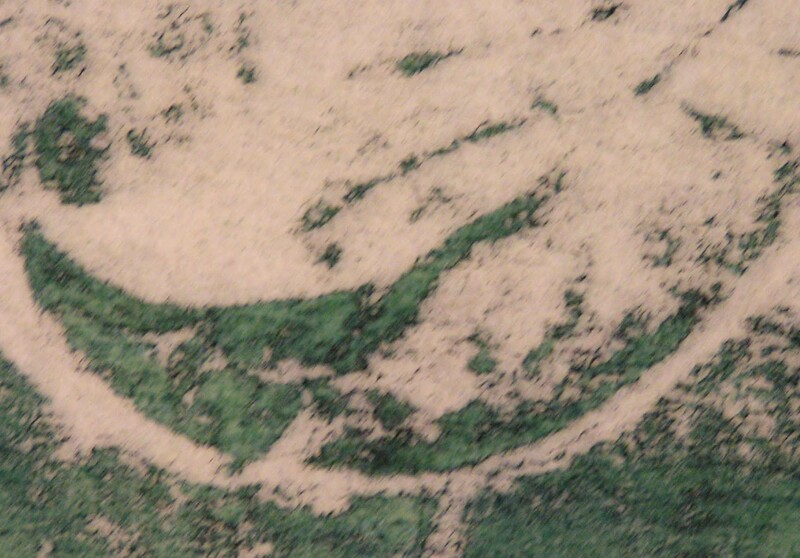 These same techniques can also be used on cotton fabric to use in fabric collage or quilting. You will learn how to create thickened dye, make your own screens and many ways to use these screens in an experimental approach. Click here for more information about Screen Printing and to register for this class. The third module is Printing, Stenciling, and Playing with Thickened Dye on Felt. (Photos above by a former student.) This one is really fun and experimental. Learn to make stamps, stencils and how to use a variety of objects from around the house to create your own unique surface design on felt. Develop your own style with designs you have created. The techniques you learn in this class can be used for felt, other fabric types and even paper. The stamps and stencils can be re-used over and over and applied in different ways to create exciting patterns. Click here for more information about Print, Stencil, and Play with Thickened Dye on Felt and to register for the class. The last module in the series is Free Motion Machine Stitching on Felt. In this course, you will learn the basics of free motion machine stitching and how to use this specifically on felted projects. Does the thought of machine stitching seem a bit scary? If so, you should take this course to get a handle on how to use your sewing machine to create wonderful embellishments on felt paintings or other felted items. We’ll start with how to set up the machine and some great practice techniques that will build your skill level until you feel comfortable with your machine. Then you’ll learn about machine lace, thread sketching and how to incorporate machine stitching into felt paintings. 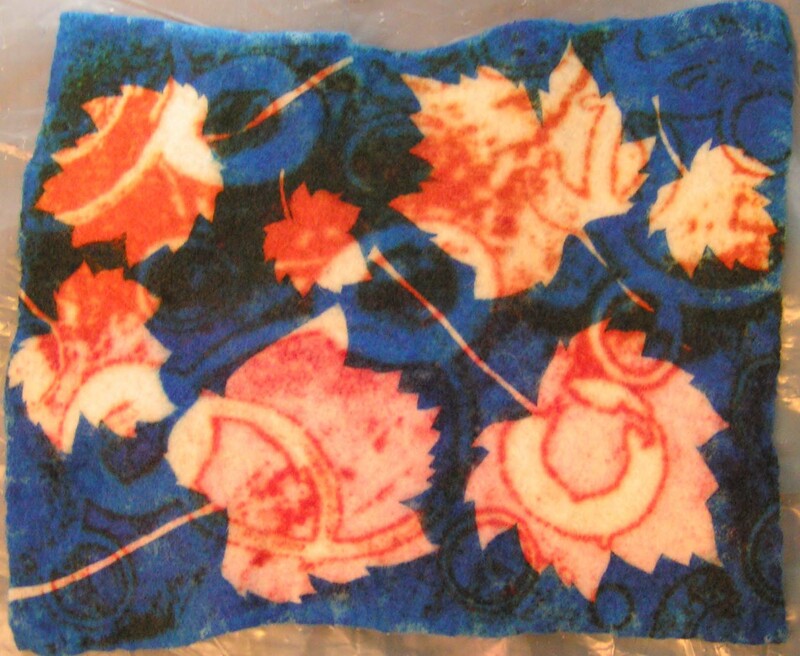 Click here for more about Free Motion Machine Stitching on Felt and to register for the class. I hope you want to expand your fiber art skills. If so, click on any of the links above to read more about the classes, see the supply lists and to register. I look forward to “seeing” you in class! And don’t forget, if you are a beginner, our online class Wet Felting for Beginners is always available. 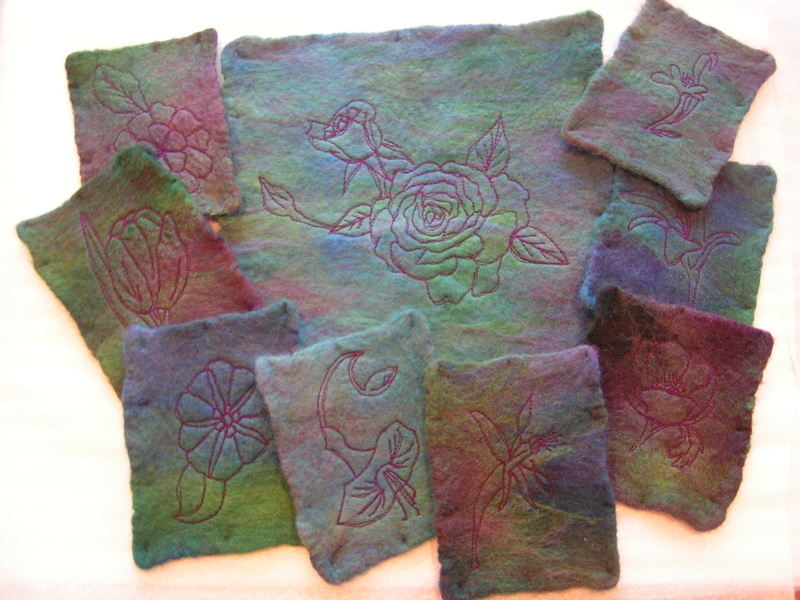 This class teaches you all about wet felting. You’ll learn how to make a piece of felt, how shrinkage works and how to calculate it and the basics of felting, fulling and creating felt from wool fiber. Click here for more information and to sign up. This entry was posted in Online Classes, Uncategorized and tagged mixed media felting, online classes, surface design on felt. Bookmark the permalink. The examples are lovely Ruth – it’s a great course that will inspire felt makers to take felt to a new level! This was a great class. I need to practice. Is was a fun class with so many different techniques. It was freeing to experiment.